EMV is an authentication technology which is used to combat card-present fraud through an embedded microchip that protects and stores cardholder data. EMV stands for Europay, MasterCard, and Visa, which were the three companies that originally created the standard. The EMV chip generates a unique transaction code that is used to communicate with the issuing bank to verify that the card is not counterfeit. Unlike magnetic stripe technology, EMV cards are extremely difficult to replicate. 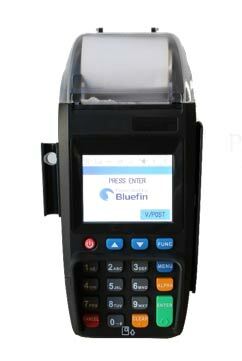 Bluefin’s PayConex platform offers devices that are certified to utilize EMV technology to authenticate credit and debit card data. As of October 1, 2015, liability for fraud-related chargebacks for transactions run using EMV chip card technology in a card-present environment was shifted from the merchant to the card-issuer. For merchants who previously had a high level of fraud-related card-present chargebacks, EMV will provide a significant money and time-saving benefit. EMV is an authentication technology, not a data security technology. EMV on its own does nothing to prevent a data breach of full-text credit card data. 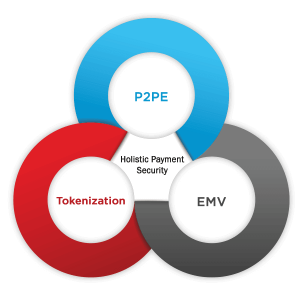 While authenticating that a card is not counterfeit and reducing chargeback liability is an integral part of a holistic payment security strategy, also implementing Bluefin’s PCI-Validated Point-to-Point Encryption (P2PE) solution is key to ensuring that your customer’s card data stays safe. 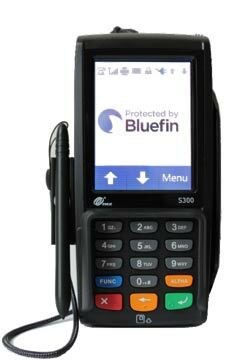 Bluefin offers both EMV and PCI-Validated P2PE as a standard setup on the PAX S300 and PAX S500 devices through our PayConex platform. EMV is also available through our Decryptx partners’ devices. Available as both a standalone and semi-integrated solution with our PayConex Platform. Available as a semi-integrated solution with our PayConex Platform.